The Chancellor of Germany is the head of government of Germany. The official title in German is Bundeskanzler(in) (literally, Federal Chancellor), sometimes shortened to Kanzler(in). The term, dating from the early Middle Ages, is derived from the Latin term cancellarius. In German politics, the Chancellor is equivalent to that of a prime minister in many other countries. German has two equivalent translations of prime minister, Premierminister and Ministerpräsident. While Premierminister usually refers to heads of governments of foreign countries (e.g., the United Kingdom), Ministerpräsident may also refer to the heads of government of most German states. The current Chancellor is Angela Merkel, who is serving her third term in office. She is the first female chancellor, thus being known in German as Bundeskanzlerin (that particular word was never used officially before Merkel, but it is a grammatically regular formation of a noun denoting a female chancellor). The modern office of Chancellor evolved from the position created for Otto von Bismarck in the North German Confederation in 1867; the Confederation evolved into a German nation-state with the 1871 Unification of Germany. The role of the Chancellor has varied greatly throughout Germany's modern history. Today, the Chancellor is the country's effective leader. The office of Chancellor has a long history, stemming back to the Holy Roman Empire, when the office of German archchancellor was usually held by Archbishops of Mainz. The title was, at times, used in several states of German-speaking Europe. The modern office of Chancellor was established with the North German Confederation, of which Otto von Bismarck became Chancellor in 1867. After the Unification of Germany in 1871, the office became known in German as Reichskanzler (lit. "Chancellor of the Realm"), although it continued to be referred to as Chancellor in English. With Germany's constitution of 1949, the title Bundeskanzler (Federal Chancellor) was revived in German. During the various eras, the role of the Chancellor has varied. From 1871 to 1918, the Chancellor was only responsible to the Emperor. With the founding of the republic and the constitutional reform in 1918, the Parliament was granted the right to dismiss the Reichskanzler. According to the Weimar Constitution of 1919, the Chancellor was appointed by the President and responsible to Parliament and to the President. When the Nazis came to power on 30 January 1933, the Weimar Constitution was de facto set aside. After the death of President Hindenburg in 1934, Adolf Hitler, the dictatorial head of government and of state (as no new president was elected) of Nazi Germany was called officially Führer und Reichskanzler (literally "Leader and Chancellor of the Realm"). The 1949 constitution gave the Chancellor much greater powers than during the Weimar Republic, while strongly diminishing the role of the President. Germany is today often referred to as a "chancellor democracy", reflecting the role of the Chancellor as the country's chief executive who has the constitutional authority to establish the guidelines for all fields of government policy. Since 1867, 33 individuals have served as heads of government of Germany or its predecessor, the North German Confederation, most of them with the title Chancellor. Due to his administrative tasks, the head of the clerics at the chapel of an Imperial palace during the Carolingian Empire was called Chancellor (from Latin: cancellarius). The chapel's college acted as the Emperor's chancery issuing deeds and capitularies. Since the days of Louis the German, the Archbishop of Mainz was ex officio German Archchancellor, a position he held until the end of the Holy Roman Empire in 1806, while de jure the Archbishop of Cologne was Chancellor of Italy and the Archbishop of Trier of Burgundy. These three Prince-Archbishops were also Prince-electors of the Empire electing the King of the Romans. Already in medieval times, the German Chancellor had political power like Archbishop Willigis (Archchancellor 975–1011, regent for King Otto III of Germany 991–994) or Rainald von Dassel (Chancellor 1156–1162 and 1166–1167) under Emperor Frederick Barbarossa. In 1559, Emperor Ferdinand I established the agency of an Imperial chancellery (Reichshofkanzlei) at the Vienna Hofburg Palace, headed by a Vice-Chancellor under the nominal authority of the Mainz archbishop. Upon the 1620 Battle of White Mountain, Emperor Ferdinand II created the office of an Austrian Court Chancellor in charge of the internal and foreign affairs of the Habsburg Monarchy. From 1753 onwards, the office of an Austrian State Chancellor was held by Prince Kaunitz. The Imperial chancellery lost its importance, and from the days of Maria Theresa and Joseph II, merely existed on paper. After the dissolution of the Holy Roman Empire, Prince Metternich served as State Chancellor of the Austrian Empire (1821–1848), likewise Prince Hardenberg acted as Prussian chancellor (1810–1822). From 1867 to 1871, the title Bundeskanzler (federal chancellor) was again used in the German language, during the time of the North German Confederation. From 1871 to 1945, the office was named Reichskanzler (Imperial Chancellor). Since 1949, the formal title of the office in the German language is once again Bundeskanzler. The head of the federal government of the North German Confederation, which was created on 1 July 1867, had the title Bundeskanzler. The only person to hold the office was Otto Graf von Bismarck-Schönhausen (better known simply as Otto von Bismarck), the Prime Minister of Prussia. Although the King of Prussia was proclaimed and sworn in as German Emperor in the Hall of Mirrors at the Palace of Versailles on 18 January 1871, the North German Confederation did not cease to exist until the 1871 Constitution of Germany went into force three months later, on 16 April. Bismarck hence remained Chancellor of the Confederation until that date. During these months, the North German Confederation was also referred to as the German Confederation, after the South German states (excluding Austria) had joined the confederation. The Chancellor was appointed by the King of Prussia in his capacity as President of the North German Confederation. His role and powers were very similar to that of the office of Chancellor of Germany from 1871.
a rudimentary federal executive, first led by Otto, Fürst von Bismarck, the Minister-President of Prussia, as Imperial Chancellor in a personal union. Technically, the foreign ministers of the empire's states instructed their states' deputies to the Federal Council (Bundesrat) and therefore outranked the Chancellor. For this reason, the Fürst von Bismarck (as he was from 1871 onwards) continued to serve as both prime minister and foreign minister of Prussia for virtually his entire tenure as Chancellor of the empire, since he wanted to continue to exercise this power. Since Prussia controlled 17 votes in the Bundesrat, Bismarck could effectively control the proceedings by making deals with the smaller states. The term Chancellor signalled the seemingly low priority of this institution compared to the governments of the states, because the new Chancellor of the Federation should not be a fully fledged prime minister, in contrast to the heads of the federal states. The title of Chancellor additionally symbolized a strong monarchic-bureaucratic and ultimately antiparliamentary component, as in the Prussian tradition of, for instance, von Hardenberg. In 1871, the concept of the federal chancellor was transferred to the executive of the newly formed German Empire, which now also contained the South German states. Here too, the terms of Chancellor and Federal Agency (as opposed to Ministry or Government) suggested an (apparent) lower priority of the federal executive as compared to the governments of the federal states. For this reason, neither the Chancellor nor the leaders of the imperial departments under his command used the title of Minister until 1918. The office of Chancellor was continued in the Weimar Republic. The Chancellor (Reichskanzler) was appointed by the President and was responsible to the Reichstag. Under the Weimar Republic, the Chancellor was a fairly weak figure. Much like his French counterpart, he served as little more than a chairman. Cabinet decisions were made by majority vote. In fact, many of the Weimar governments depended highly on the cooperation of the President, due to the difficulty of finding a majority in Parliament. Adolf Hitler was appointed Chancellor of Germany on 30 January 1933 by Paul von Hindenburg. Upon taking office, Hitler immediately began accumulating power and changing the nature of the Chancellorship. After only two months in office, and following the burning of the Reichstag building, the Reichstag body passed the Enabling Act giving the Reich Chancellor full legislative powers for a period of four years – the Chancellor could introduce any law without consulting Parliament. Powers of the Chancellor continued to grow until August 1934, when the incumbent President Paul von Hindenburg died. Hitler used the Enabling Act to merge the office of Reich Chancellor with that of President to create a new office, der Führer; although the offices were merged, Hitler continued to be addressed as "Führer und Reichskanzler" indicating that the Head of State and Head of Government were still separate positions albeit held by the same man. This separation was made more evident when, in April 1945, Hitler gave instruction that upon his death the office of Führer would dissolve and there would be a new President and Chancellor. On 30 April 1945, when Hitler committed suicide, he was briefly succeeded as Chancellor by Joseph Goebbels, as dictated in Hitler's will and testament. With Goebbels following Hitler's suicide with his own, the reins of power passed to Grand Admiral Karl Dönitz as President of Germany. Dönitz, in turn, appointed non-partisan conservative Count Schwerin von Krosigk as head of government with the title Leading Minister. Dönitz and Schwerin von Krosigk negotiated the surrender to the Allies. The chancellor's authority emanates from the provisions of the Basic Law and in practice from his or her status as leader of the party (or coalition of parties) holding a majority of seats in the Bundestag (federal parliament). With the exception of Helmut Schmidt, the chancellor has usually also been chairman of his or her own party. This was the case with Chancellor Gerhard Schröder from 1999 until he resigned the chairmanship of the SPD in 2004. The German Chancellor is officially addressed as "Herr Bundeskanzler" if the Chancellor is a man. 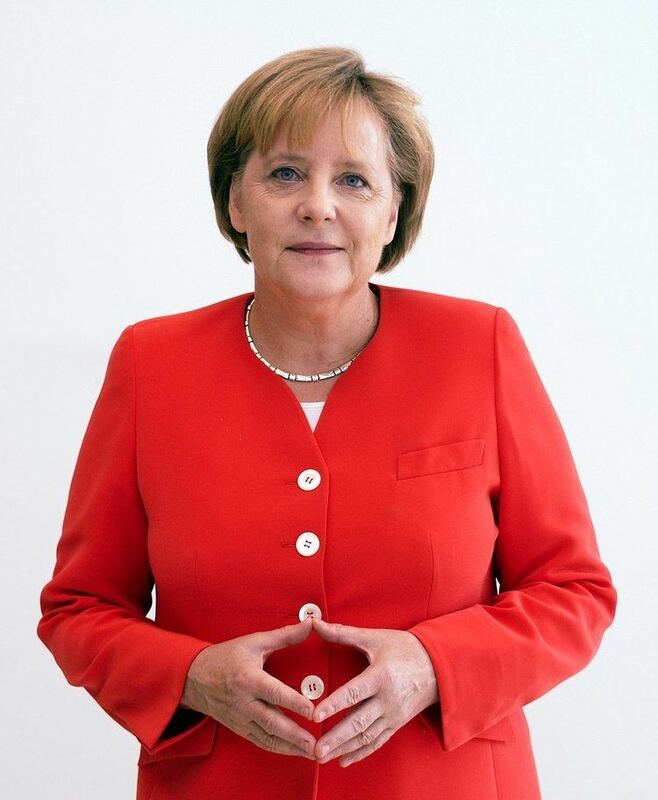 The current female Chancellor Angela Merkel, once considered the most powerful woman in the world by Forbes Magazine, is officially addressed as "Frau Bundeskanzlerin", the feminine form of the title. Use of the mixed form "Frau Bundeskanzler" was deprecated by the government in 2004 because it is regarded as impolite.